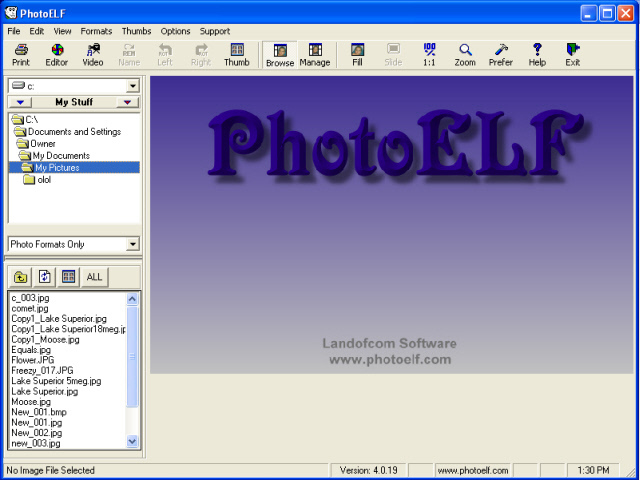 PhotoELF is an image processing toolbox with hundreds of features. Easy to use and intuitive. View 82 different image formats as well as video clips. Excellent printing utility with user defined templates. Create fun calendars and posters and extract frames from video clips. This list goes on: Batch edit hundreds of photos in seconds, including: batch renaming, resizing, compressing and more. PhotoELF is The digital camera companion. ...... ?s easy to use and intuitive. View, Edit and Print 82 different image formats as well as video clips. Excellent printing utility with user defined templates. Print up to 144 different photos per sheet. Print any size photo from posters to wallet size and beyond. Supports borderless printers. Rotate, crop, and remove red-eye with ease. Create fun calendars, holiday cards, magazine covers with your favorite all-star or ballerina, and even posters. Add fun masks to your photos from PhotoELFa? ?s existing menu or create your own. Edit your photos using a Transparent Paint Palette, Contrast, Brightness, Color Saturation, Sharpness, and DeSpeckle functions. Use the Sepia Tone function with 3 Levels of Sepia effects for that special touch. Extract frames from video clips and save them as JPG. Qweas is providing links to PhotoELF 4.1.12 as a courtesy, and makes no representations regarding PhotoELF or any other applications or any information related thereto. Any questions, complaints or claims regarding this application PhotoELF 4.1.12 must be directed to the appropriate software vendor. You may click the publisher link of PhotoELF on the top of this page to get more details about the vendor.